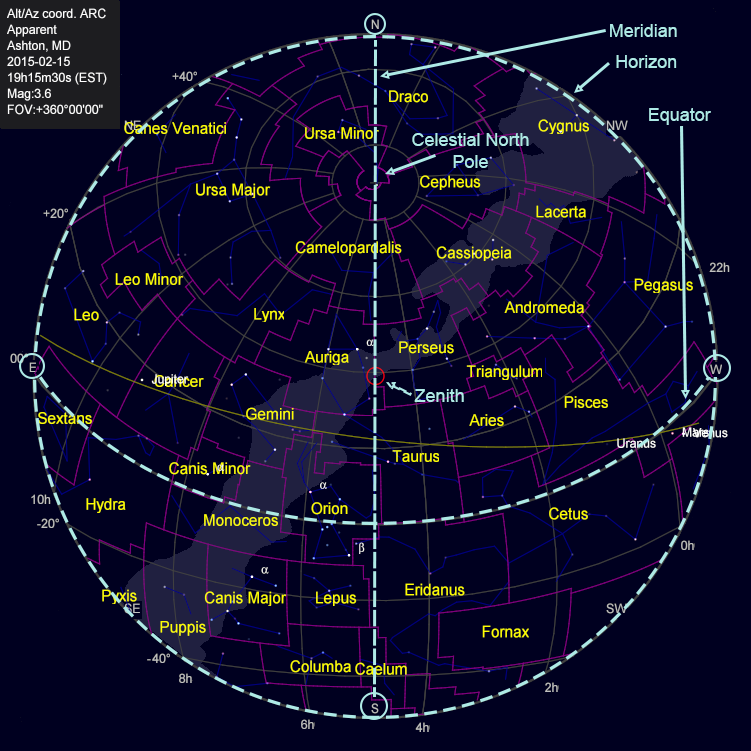 The horizontal (east-west) lines, or circles, on a globe or map are called parallels of latitude. The equator, or the largest circle half way between the two points were the globe is attached to its stand, is a special parallel that is designated as the zero degree latitude. As viewed from the center of the Earth, latitude is measured in degrees of separation from the equator. Ashton MD, for instance, is at N39.14° latitude, which means that it is separated from the equator by 39.14°. The Earth’s north pole, which would be directly overhead for an observer at the center of the Earth, is at latitude N90°. The vertical, or north-south, lines on the celestial sphere are known as right ascension, and are marked not in degrees, minutes and seconds, but in hours, minutes and seconds. Lines of right ascension are somewhat related to longitude, but since the Earth turns about its axis within the celestial sphere, the relationship is not fixed. The difference in the units of measure, degrees of longitude vs hours of right ascension, accounts for the changing relationship between the “fixed” surface of the Earth and the celestial sphere that “rotates” across the sky. There are twenty-four hours of right ascension on the celestial sphere, which is related to the length of a day on the surface of the Earth. Two different hour lines of right ascension are one hour, or 15° apart. Fifteen degrees is exactly how much the celestial sphere appears to rotate in one hour. Twenty-four right ascension hours spaced 15° apart represent the 360° circle around the celestial sphere. Declination is the measure in degrees of separation between the celestial equator, and a point on the celestial sphere, and it is the celestial sphere’s corollary to terrestrial latitude. Like lines of latitude, lines of declination usually run horizontally, or east-west on a chart. Declination lines more distant from the celestial equator, or 0° declination, have higher numbers. North declination is identified as a positive number (+40°) while south declination is identified as a negative number(-40°). To illustrate the relationship between declination and latitude, consider the terrestrial equator, which is 0deg latitude. The sum of all zenith points at the terrestrial equator define the celestial equator. Similarly, zenith for an observer in Ashton, Maryland (N39.15° latitude) is +39.15°. This can be observed on the sky chart below that prepared for Ashton, Maryland that was previously examined. Note that the zenith falls just south of the declination line that represents +40°. Annotated Sky Map. Jim Johnson, December 27, 2014. All of the stars and other objects that might be seen in the sky are at varying distances from us. Since even the nearest of these objects are so far away, our mind perceives them as all being at the same indeterminable distance away. For this reason and for the purpose of this amateur stargazers, the sky and all that it holds can be thought of as the celestial sphere – much like the inside of a planetarium dome. 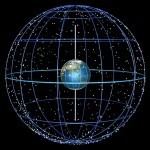 Stars are fixed points upon this sphere that all move together across the sky. Imagine the earth at the center of this sphere, and that the sphere surrounds the entire earth. In reality, the earth spins on its axis beneath the celestial sphere. The point on the earth’s surface from which we happen to be observing circles the earth’s once each day, and we observe the celestial objects passing through our field of view, or the sky, from east to west. Our perception is that the earth is fixed, and the celestial sphere turns above us. For casual observational purposes, and for ease of explanation, the remainder of this discussion will assume the perceived motions. There are two ways to think of constellations. 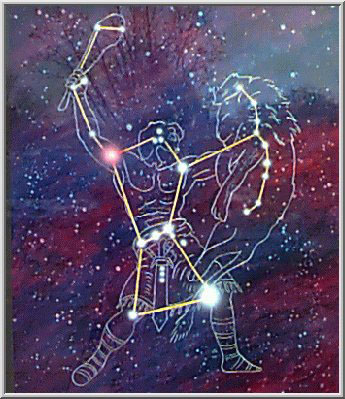 First, and foremost, a constellation is a grouping of stars that usually represent some mythological being. 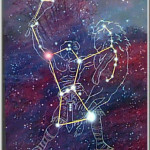 In the first chart Orion appears as a stick figure torso with a belt of three stars and holding what is depicted as a raised club and perhaps a dead lion. The interconnecting lines aid in identifying the spatial relationships between the constellation’s stars by guiding our eye from one star to the next. 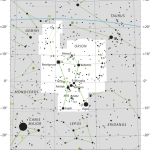 Secondarily, a constellation is an area of the sky, which is delineated in the second chart by the white field. 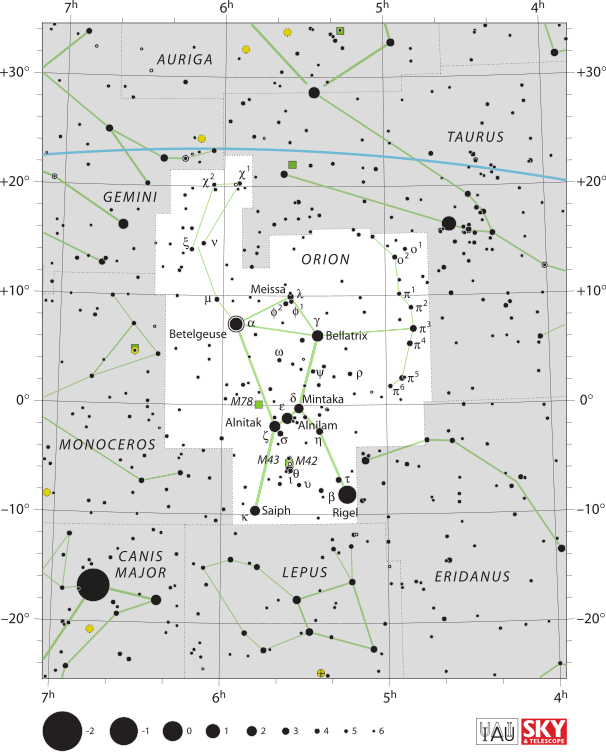 If the Sun, Moon, a planet, or some other celestial object happens to appear within a constellation’s borders, it is said to be located in that constellation. Orion. yuzukiyuki93.blogspot.com. Accessed by Jim Johnson on January 7, 2015. IAU and Sky & Telescope magazine (Roger Sinnott and Rick Fienberg), June 5, 2011. Defining the horizon is rather simple: walk out into the middle of a large, open field, or just imagine yourself standing there. Lift one arm until it is horizontal, or at 0° elevation, and point in any direction at the “line” where the sky meets the earth. This is a single point (see what I just did there?) on the horizon. Keeping your arm extended horizontally, turn about in a complete circle, or 360°, and the horizontal circle traced out by the extended finger has traced out all of the points that make up the horizon, which we will simply refer to as the horizon. – Zenith. Addison Welsey. cse.ssl.berkeley.edu/ Accessed by Jim Johnson on January 19, 2015. A working definition of the horizon is necessary to understand the sky. All that is below the horizon is earth, and all above is sky. The meridian is a special line in the sky that is related to an observer’s location. It is defined by three points: 1) the north point on the horizon, 2) the zenith, and 3) the south point on the horizon. By extending an arm horizontally and pointing north, then swinging the arm upward until it is pointing straight up overhead, and continuing in that direction, which is now a downward motion, until reaching the south point on the horizon, an observer has traced the meridian. The meridian remains stationary while the celestial sphere appears to rotate past it as the earth rotates about its axis. 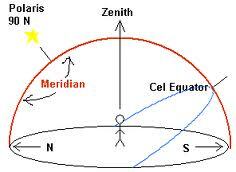 All objects that we observe on the celestial sphere appear to move perpendicular to the meridian. When an object on the same declination as the observer’s latitude rises from the east and ascends to the meridian, it has reached its zenith. From then on, the object descends toward the western horizon. 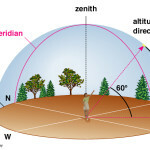 Objects that are at a greater or lesser declination than the observer’s latitude have also reached their highest point when crossing the meridian, but will cross the meridian either north or south of the zenith. The knowing what time an object reaches the meridian is important for an observer wanting to get the very best possible view of an object. The view toward the zenith is the clearest possible view, because the observer is looking through the thinnest possible cross section of the earth’s atmosphere. The view toward the horizon, however, is through the thickest possible cross section of the atmosphere, and this is where atmospheric haze will degrade viewing conditions the most. No matter the object’s declination, the time that it crosses the meridian is its closest approach to the zenith, and the very best possible time to observe. – The Meridian. http://www.uni.edu. Accessed by Jim Johnson on January 31, 2015. Simply stated, the zenith point in the sky is the point that is straight up above a specified location on the earth’s surface. Its location can be described more precisely by imagining a line originating at the center of the earth, extending up to the surface at the observer’s feet and exiting the top of the observer’s head. The point where this line touches the celestial sphere is the zenith point. It can also be defined as a 90° angle upward from any, or from every, point on the horizon. 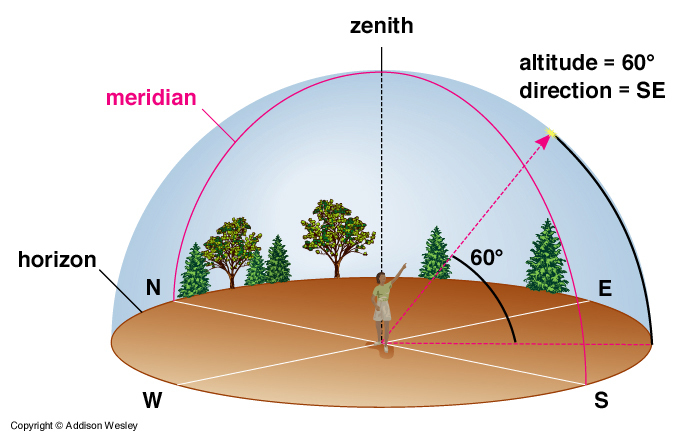 The zenith’s location is relative to the observer’s location. So long as the observer remains in a fixed location, the zenith remains fixed, and stars of the same declination as the observer’s latitude will appear to move through the zenith as the earth rotates. If the observer moves from that location by walking north, for instance, then the zenith moves north along with the observer. As previously alluded, the declination of the zenith is the same as the observer’s latitude. 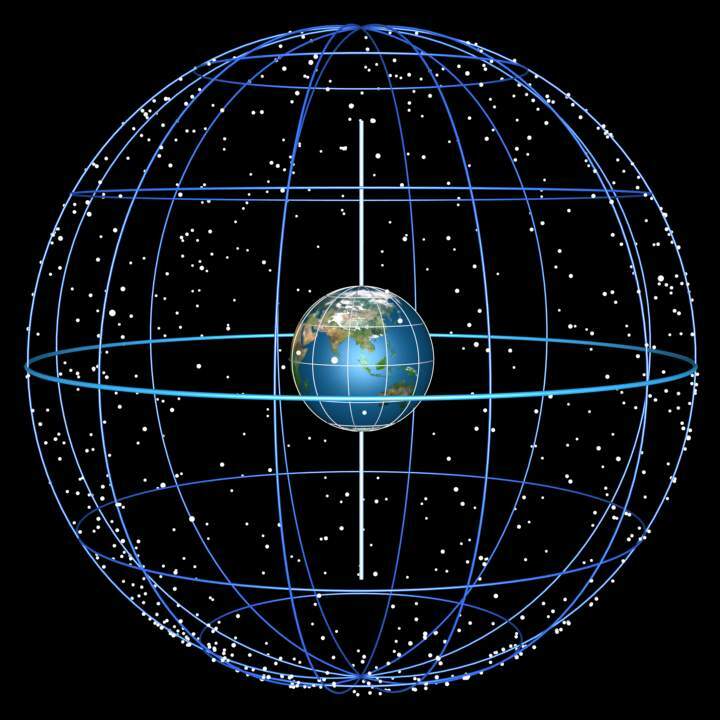 If an observer is standing of the terrestrial equator, then the observer’s zenith is on the celestial equator, which turns overhead as the celestial sphere appears to turn as a result of the earth’s rotation about its axis. Also, if an observer is standing on the terrestrial north pole, then the zenith will be at the celestial north pole, and all stars will appear to circle the zenith as the earth rotates. – Horizon and Coordinate System. http://cse.ssl.berkeley.edu/bmendez/ay10/2002/notes/lec2.html. Accessed by Jim Johnson on January 19, 2015. – Celestial Sphere. ASTR 1230 (Majweski) Lecture Notes. http://www.astro.virginia.edu/class/majewski/astr1230/. Accessed by Jim Johnson on January 19, 2015. –Zenith. http://www.opencourse.info/astronomy/introduction /02.motion_stars_sun/. Accessed by Jim Johnson on February 1, 2015.